Agnes Hildebrandt is the dynamic force driving the indesign financial group ltd. team. Her passion for life and helping people to live it abundantly is at the core of her business practice. Over the years Agnes has seen the disastrous effects on families—including her own—when life’s tragedies and setbacks occur. She has seen the hardship that inadequate planning causes and can help you prepare for such uncertainties. Above all, Agnes listens to you. She will help you to identify your vision, make decisions and take action needed to realize your goals. Her unique qualifications, vision, keen intelligence, versatility and experience empower her to recommend the appropriate choices for you. Then she presents them in step-by-step increments you can understand. Agnes also knows how you can safeguard your assets to your advantage. She has helped many Canadians, new immigrants and others not familiar with their options to maximize their wealth and protect it. 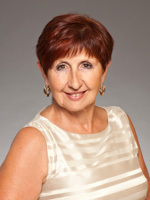 In addition, as the first woman in Western Canada hired by London Life, Agnes is especially sensitive to the particular issues women face in life and finance. She has also helped widows to manage estates, protect their legacy and build dynasties which last for generations. Her indesign financial group ltd. partners respect her work ethic, her unique gifts as well as her superb ability to discover and create opportunities for her clients. Her numerous satisfied clients confirm it. For good reason, they trust her. Many of them call her a family friend.